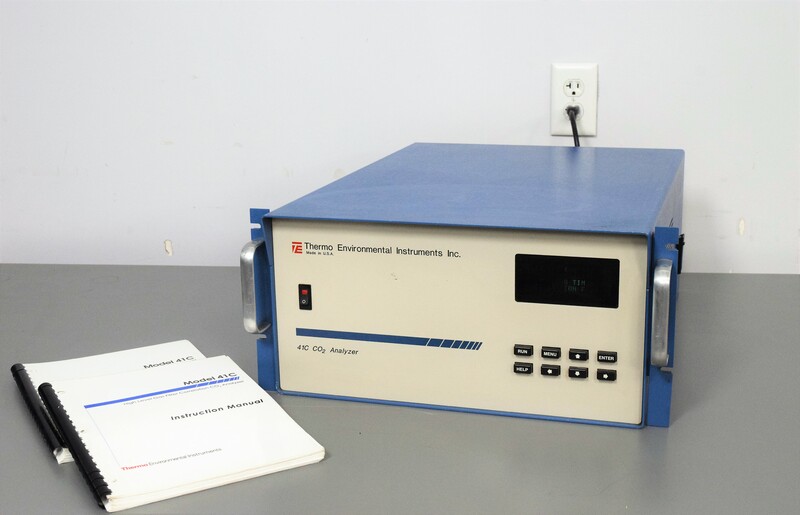 Thermo Environmental 41C Co2 High Level Analyzer Gas Filter Correlation . New Life Scientific, Inc. The Thermo Environmental 41C Co2 High Level Analyzer was tested by our New Life Scientific technicians; the analyzer powers on and the pumps function properly. Cosmetically it is in good condition with minor wear and age. The 41C Co2 High Level Analyzer uses an exact calibration curve to linearize the instruments output. Our in-house technicians did a visual inspection of the Thermo Environmental 41C Co2 High Level Analyzer; tested as far as powers on and the pumps function. They did get a reading for the CO2 PPM which increased when the port was blocked and decreased when unlocked. It has an alarm for service, but it is a good working analyzer. This system has been partially tested and is also supported by our 90-Day Warranty.